An autumn hike up McGee canyon serves up one of the most bountiful feasts of fall scenery in the entire Sierra, if not the state! The eye-popping gold of the Aspens, Cottonwoods and Willows reach their peak color during the first two weeks of October in this highly scenic canyon just south of Mammoth. As you head up the trail alongside the healthy flow of McGee creek dramatic peaks shaded in rich hues of red, crème and brown metamorphic rock will surround you. Further on up the trail, you'll leave the fall color explosion behind and switchback steeply through a forest of Lodgepole pines to sublime Steelhead Lake. This hike in the John Muir Wilderness has it all: spectacular fall foliage, a rushing stream, a lovely alpine lake and close-up views of rugged, colorful peaks. 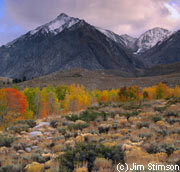 Travel 32 miles north of Bishop or 8 miles south of the Mammoth turnoff on US 395, turn west at the McGee Creek exit. Follow this road 4 miles, past the McGee Creek Pack Station to the road end parking. From the parking area, the trail begins as an old jeep trail and soon enters the John Muir Wilderness. The jeep trail is unused and has reverted to its primitive state. The canyon is mostly sage and rabbit brush covered, but closer to the creek, there are also Black Cottonwood, Water Birch, Copper Birch and Quaking Aspen. The trail follows along McGee Creek, and then steepens as it turns west through a Lodgepole forest. Along here the trail crosses many fords of McGee Creek, and during the early season high water levels are something to watch for. Soon after, the trail leaves the jeep road at a signed junction and continues to a junction with the Steelhead Lake lateral. (This junction is farther than indicated on the maps. It is where the trail finally returns to creek side.) The route to Steelhead Lake branches left (east). The trail switchbacks steeply from here up to Grass Lake, then switchbacks up another steep slope to finally reach the north end of Steelhead Lake (10,350'). From Steelhead Lake, one can see Mt. Stanford to the south, Mt. Crocker to the west, and Mt. Baldwin to the north. The trip to McGee Lake begins as the trip to Steelhead Lake, until the junction with Steelhead lateral. Continue on the main trail here, taking the right branch of the fork. The trail will lead south over a forested and rocky slope, then through meadows and under White Bark Pine, Lodgepole and Mountain Hemlock to the slopes below McGee Lake (10,480'). Nearby, at Little McGee Lake, Crocker Lake and Golden Lake there is good fishing. Continuing on the trail past McGee Lake will lead you to McGee Pass (11,900'), and from there to Fish Creek, and Lake Edison.